I got home from London last night completely shattered and was in bed by 10pm. Not that I've done any better all week; the course was hard going with a lot to take in... On Wednesday night, I was practically falling asleep while trying to knit! Except maybe Friday morning, when they'd had a private party stay over the previous night which meant that going down for breakfast was hectic. At one point, the staff were stopping guests going into the restaurant while they waited for people to finish so there would be enough seats and you could get near the food! Today has been a fairly gentle day. I've done a little (and I mean a little) housework. Tried to catch up with email and this afternoon, I was very brave and ventured into the fabric stash, mostly to see what is actually in there. Here is approximately half of it, which was all I could face digging through in one session. 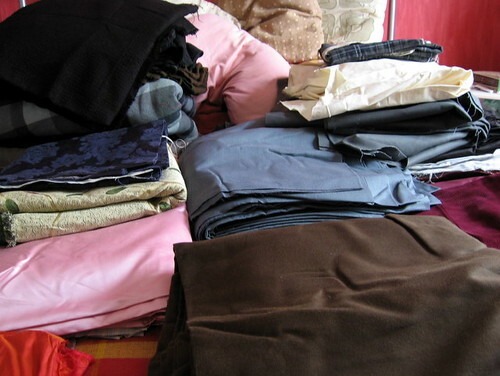 Once I'd laid the previously heaped fabric on the bed, I was pleasantly surprised at how little there was. Heaped in a corner, it looks far larger, although I'm going to admit there's still a lot of material there... And I've absolutely no idea what I'm going to do with it. Including some very nice suitings. 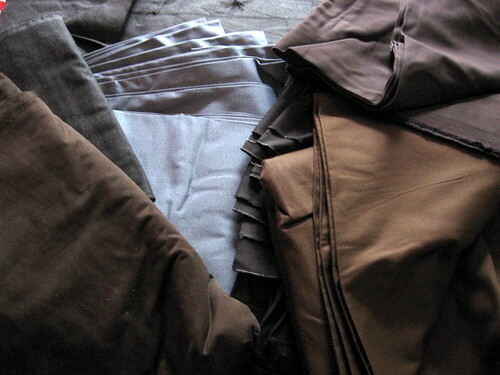 Cotton canvas, mostly in a suitable weight for either robes or coats and varying colours. 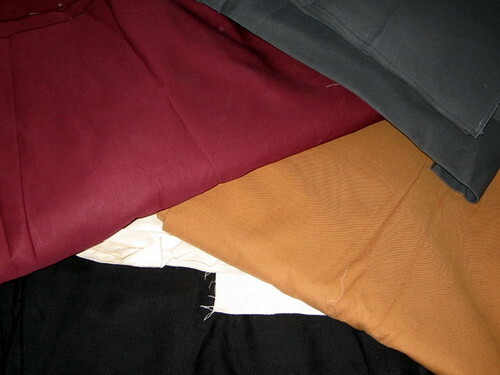 Two meters of each colour here which I remember buying intending to make a short summer jacket for me for normal day to day wear, rather than costume. Only I couldn't decide on the colour, so naturally I bought both! You can see why I have a fabric problem perhaps? Again, not bought with anything in particular in mind. I just liked it and the next thing you know, it was mine! 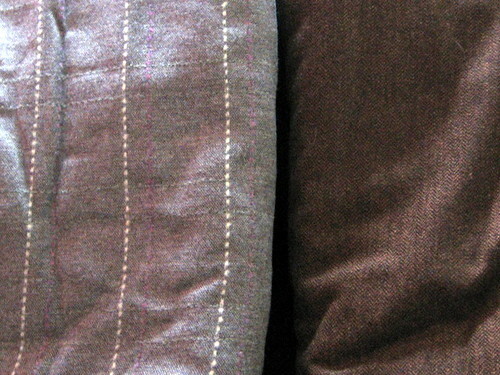 Then there are the fancy fabrics. 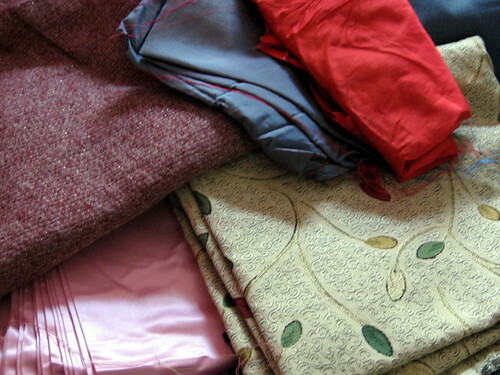 Silks, silk mixes, even cashmere. 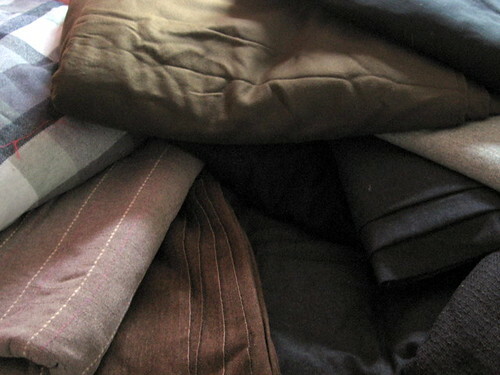 Not a lot of each and with the exception of the cashmere, bought with linings in mind. 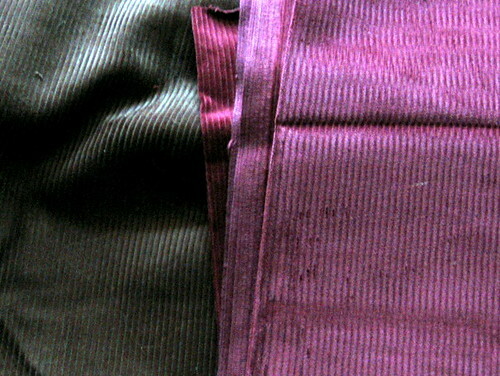 The pink silk/cotton I was thinking would be a fantastic lining for Georgian waistcoats for example. The cashmere... It sparkled... Other than that, I have no excuse. Some really pretty fabric there, it makes good photos as well. The pink silk/cotton, if it is the stuff from Croft Miles as was, is fantastic stuff and well worth keeping. You seem to have an eye for finding moleskin and brushed cotton I struggle to find any most of the time and I too love it. Wow! Even though I am not a material stasher, (just a yarn stasher) I am seriously impressed!